Internal theft is the leading cause of loss in the retail and restaurant industry. Although, in theory people enjoy the discussion, in practice the confrontation can be discomforting. No employer wants to “believe” that their employees have stolen from them. 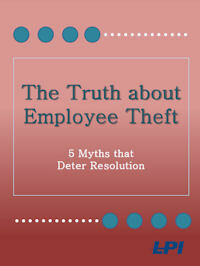 Often that discomfort helps to create certain myths about employee theft. In psychology there is something called the “self-confirming” hypothesis. That is we only attend to the information that supports what we already believe. In an investigation that means we seek out only the evidence that supports our theory and ignore the pieces that don’t fit. This eBook contains some of the most common "myths" or beliefs that companies hold in evaluating the level of employee theft in their organization.